Nina Figueroa, a salad bar prep cook in the Flatiron District, is always on the lookout for behaviors and products that can help her lose weight and stay healthy. A few years ago, she decided to try Herbalife, the multi-level marketing company that encourages its members to replace meals with smoothies and supplements they purchase at a premium from Herbalife salespeople. For Figueroa, the shakes and teas were worth the $50 monthly price. She combined the daily shakes with exercise and healthy eating, lost twenty pounds and maintained her progress for four years until she became pregnant. Other Herbalife users she knew did not share her success when they purchased the products, she says. Their wallets shrunk, but not their waistlines. Like many health-seekers learning about nutrition and lured by marketing come-ons, they considered the products a cure-all for obesity, she says. In order to counter fanciful marketing, debunk nutrition myths and encourage the consumption of healthy foods, nonprofits have teamed up with vendors and community leaders on a number of public health initiatives designed to channel the desire for better health in low-income communities. While trendy digestible products marketed to the wealthy and the wannabe-elites — like wheatgrass shots and Goop’s vitamin “protocols” — fuel reasoned blog posts and snarky Twitter takedowns, the prevalence of expensive supplements and wellness programs of dubious nutritional validity also penetrate underserved communities. A faded ad for the supplement Desintrix in the window of a pharmacy on 116th Street and Lexington Avenue promises, in Spanish, to help consumers lose weight and control stress. The poster says the product is “100 percent effective” and the bio on the manufacturer’s Twitter page — inactive since 2014 —says the product is a “colon cleanser” that “helps fight constipation and lose weight.” For her part, Figueroa says she gave up using the supplement because it gave her painful stomachaches. ENP Products, the manufactures Desintrix, did not respond to request for comment. Herbalife also did not provide a response. Outside another pharmacy on Broadway in Washington Heights, a large sandwich board with photos of shredded woman’s abs and a muscle-bound man’s torso advertises the Flatbelly Tea. The supplement — $13.99 for a 16 oz. bottle — sits amid various weight-loss cures on a shelf next to the front door, the first thing one sees upon entering the store. A bulleted list crammed between those images of rippling abs and obliques on the label says the supplement “flattens [the] tummy, removes waste [and] burns body fat.” The unregulated liquid contains four herbs and alkaline water. Various other vendors — like a shop in Claremont Village near the Grand Concourse hocking a line of detox bitters branded as “beneficial” for diabetes, cancer and hepatitis — sell the same too-good-to-be-true health claims. Nutritionists and public-health workers say the products pose a financial burden to low-wage workers and individuals with fixed incomes who want to improve their health. Get-fit-quick promises also exploit a broad desire to improve health in communities with high rates of obesity and related health problems, says Emma Rodgers, the Senior Program Manager for the Institute for Family Health team that leads Bronx Health REACH, a coalition of community-based organizations, churches and medical providers. In Harlem, for example, a man who receives a monthly $822 Supplemental Security Income check placed a regimen of 10 supplements worth more than $200, on a table. His inventory included a container of 2000 mg garlic pills, two types of turmeric extract — “with 95 percent curcuminoids” — and Focus Factor brain health supplement, a product advertised on broadcast television stations. The man could attain the nutrition he seeks from whole foods and save a significant proportion of his annual income — a concept nutritionists want to share with their clients. Earlier this year, the Robert Wood Johnson Foundation’s annual County Health Ranking Report listed the Bronx as the least healthy of New York State’s 62 counties. The Bronx also leads the state in cardiovascular disease, according to the most recent state Department of Health (NYSDOH) data. The effort to improve those dismal health outcomes propels public-health experts into corner stores from Morris Park to Port Morris where they engage bodegueros in boroughwide behavior change. In 2015, Bronx Health REACH partnered with the Bodega Association of the United States — which has about 1,000 Bronx-based members, Rogers says — to encourage vendors to stock more healthy items. The coalition even produced a series of videos, entitled Local H.E.R.O. Bodega, in collaboration with the Hispanic Information and Telecommunications Network. The videos advise bodega owners on how to earn more money while selling healthier goods. One solution is to replace 20 percent of inventory with more nutritious foods, a move, the host says, that will enable owners to control their profit margins. Processed snacks typically arrive pre-priced, which means that manufacturers control the wholesale cost to the point-of-sale vendor and the ultimate cost to the consumer, the video explains. Healthy items, like fresh fruit, take up the same amount of space as junk food, but yield a higher profit margin because the bodega owners can often negotiate purchase price and adjust sale price. On Wednesday, Bronx Health REACH members gathered at BronxWorks to announce a Healthy Bodega initiative partially funded by the U.S. Centers for Disease Control and Prevention and NYSDOH. So far, 36 Bronx bodegas have signed on to sell more healthy foods, like low-fat dairy products and low-sodium packaged items. Rogers says Bronx Health REACH has begun collecting and analyzing community data related to the presence of healthier food. Bodega owners often tell the Bronx Health REACH team that they want to offer more nutritious items to their communities, but they need to know local residents will buy them, Rogers says. Indeed, the mere presence of healthy food does not guarantee behavior change and ensure the demand that will keep store owners stocking their shelves with fresh vegetables. A 2015 study in the journal Public Health Nutrition assessed the impact of a new grocery store on eating habits in a “high-need” area of Morrisania. After a year of talking with community residents, the study’s authors discovered “no statistically significant impact on consumption habits” and concluded that accessibility does not automatically mean people will consume more kale and carrots. To accomplish meaningful behavior change, stakeholders have to engage the community in a gradual, respectful and culturally sensitive manner. In some cases, that means harnessing the energy around supplements, fad diets or popular nutrition programs, says Julianne DiMaio, a nutritionist and diabetes educator at the Institute for Family Health. Rather than criticize or alienate individuals who consume specific supplements or get involved with programs like Herbalife’s meal replacement plan, DiMaio encourages people to refocus their goals and plan for the long-term. “You’re having two shakes instead of meals and then what happens?” DiMaio says she asks her clients. “What will you eat for the other meals? She likens some of the marketing of quick-fix products to the presence of sugary cereals at eye-level in supermarket aisles or processed snack cakes at the bodega cash register. In those cases, what people see is often what they get. To combat the spread of type II diabetes, which she says she observes in children as young as eight, DiMaio and her team run pediatric obesity support groups for parents and children. Every Friday afternoon for twelve weeks, overweight children and their parents meet with nutrition experts as a group and learn healthy eating habits through interactive activities like exercise, meal preparation and supermarket tours. Bronx Health REACH also works with community leaders, like pastors, to deliver their message of health to a wider audience. Reverend Theresa Oliver, a pastor at the Mt. Zion Christian Methodist Episcopal Church in Soundview, says she began working with Bronx Health REACH to normalize conversations about nutrition in her congregation and introduce members to local farmers’ markets — an occasionally challenging experience for urbanites accustomed to plucking their produce from sterile supermarkets or cramped bodega shelves. New Yorkers who want to see fewer soft-drink ads pasted in low-income communities can actually take action by adopting a shop through the Shop Healthy NYC program. Though they are dwarfed by the usual advertisements that clutter bodega exteriors, small Shop Healthy NYC stickers announce to customers that the shop stocks healthy items in response to community requests. The De Blasio administration’s Office of Food Policy website provides sample scripts and store owner surveys for residents who want to encourage vendors to start selling more healthy food. 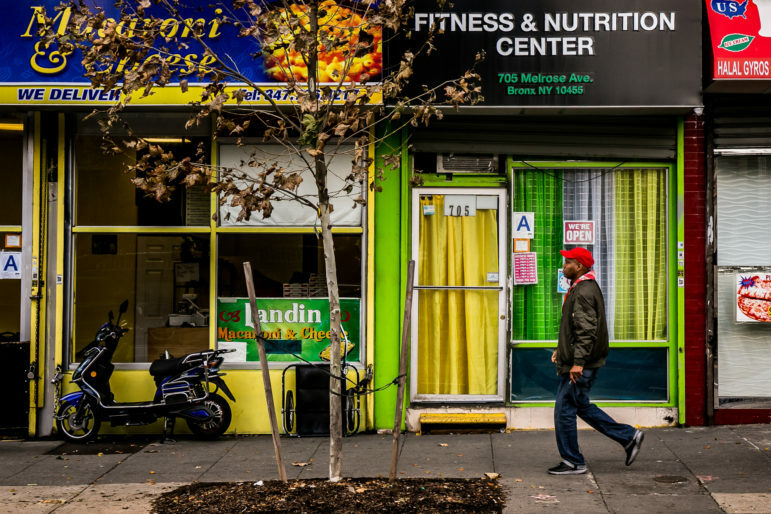 Carolina Espinosa, a BronxWorks nutrition coordinator and registered dietician, says bodega owners are often “very keen” on working with residents and the experience can help foster a healthier environment overall, she says. CityPlate, City Limits’ series on food policy, is supported by the Laurie M. Tisch Illumination Fund. City Limits is solely responsible for the content. CityViews: Myths About Public Benefits Plague Debate in D.C.
‘Narratives about those receiving public benefits depict them as scammers living large off the hard work of tax-paying Americans. This is far from the truth.’ Watch a video op-ed. Scientists used to think ‘food deserts’ were linked to severe health risks, like obesity. But it turned out the existence of food swamps more accurately predicts obesity rates. UrbaNerd: Is There Enough Nutrition Education in NYC Schools? Researchers created a filterable database of nutrition education programs that are active in the city.